This is FRESH AIR. I'm Dave Davies in for Terry Gross, who's off this week. As the deputy national security adviser to President Obama, Ben Rhodes was part of a team that dealt with a series of foreign policy crises and initiatives - the Arab Spring, military intervention in Libya, the civil war in Syria and the rise of ISIS, the Iranian nuclear negotiations, the diplomatic opening toward Cuba and others. Besides helping to analyze events and advise the president, Rhodes wrote presidential speeches and handled communications on national security issues. Before joining then-Senator Obama's campaign for the White House in 2007, Rhodes helped to write the reports of the 9/11 Commission and the Iraq Study Group, formed by Congress in 2006 to develop recommendations for the war in Iraq. His new memoir is an inside look at the administration's foreign policy deliberations and a reflection on his personal experience. The book is called, "The World As It Is." Well, Ben Rhodes, welcome to FRESH AIR. Give us just a bit of a sense of what your daily routine was like at the White House, what the place was like. BEN RHODES: Yeah. I mean, I have to say, when I first went to work in the West Wing, the most daunting thing was how small this place was, that you walk in and it's three floors, and there's a few offices on each floor and that's it. And you're thinking, where are the other people who are going to make sure that we get this right? And then you realize that there are no other people. It's just you and those offices. And my routine was kind of frenetic, Dave, 'cause I ended up having kind of multiple jobs. My job description evolved over the years. But, you know, I could be woken up in the middle of night to be told about some terrible event that we'd have to have a response to. I'd come into work. I'd get the presidential daily briefing, so the briefing that Obama was going to get. A person would sit in my office and walk me through that intelligence. Then I'd go up to Obama's office, and we'd have the briefing with him. And you're basically told about the worst things that are happening in the world in that briefing, and then you have a meeting to decide what you're going to do about it. Then my late morning was often spent trying to figure out what we were going to say. You know, what's the White House press secretary or the State Department spokesperson going to say about whatever the most pressing events are in the world. Then the afternoons were the policy meetings. And so you're either meeting at the deputy level or the principal level and the cabinet level or the subcabinet level to work through, you know, what is our approach to the Iran nuclear negotiation, or what is our response to a North Korean provocation going to be, or what are we going to do about the Paris climate negotiations? So you kind of formulate your policy recommendations in those meetings. And then, you know, towards the end of the day, I'd probably have meetings related to something that was important to me, Dave, which is, what are we trying to do affirmatively in the world? You know, you can only respond to events, you know, you could spend all your time responding to crises in the Middle East. You know, what are we going to do to try to actually shape events instead of just responding to them? DAVIES: I want to talk a bit about a few examples of the work that you did. One of them was planning an address in the president's first year in office that came to be known as the Muslim Speech. What was the origin of this project? RHODES: Well, you know, as I describe, it's one of these things that kind of came about by accident, in a way. In a campaign speech where he was talking about his approach to terrorism, he was trying to determine how he would set a new tone. And he said, you know, in the first hundred days of my presidency, he said, I want to address the Muslim world and set a new tone for what we're doing. And even though this was kind of just a line at the end of a campaign speech, it got a lot of attention, particularly in the Muslim world, where people wanted a new tone after the Bush years and Guantanamo and torture in Abu Ghraib. And so when we came into office, we knew, you know, he was going to give this speech. And the question became where should he give it? And we had a kind of interesting debate because some people wanted him to go to Jakarta because he'd lived there as a child. And, frankly, that would be a lot less fraught in that, you know, you could lift up the example of Indonesia as a tolerant and pluralistic place. And then some of us wanted to go to Cairo, thinking that, you know, the heart of the problems and the challenges between the United States and the Muslim world were really in the Arab world. And we took this to Obama, and he said, look, I'm going to go to the heart of the issue. I'm going to go to Cairo. And it was very much like him to say this is not worth doing if we're just going to try to do the easiest thing. I'm going to do this in the hardest possible venue, which is the heart of the Arab world. DAVIES: Right. And so you talked to him and produced a first draft. And, you know, I'd like you to talk a little bit about the process, kind of what your first incarnation of his thinking was, and then, of course, it goes to other principals in the government - I mean people who have big, important jobs and long experience - and the kinds of recommendations that they made. Give us a sense of how that went. 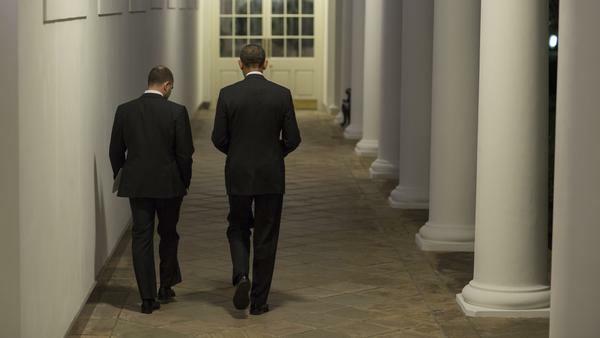 RHODES: Well, Obama really cared about what he said. And, you know, I think in some presidencies with some politicians, you could do a whole draft before even getting the input from the principal. But he would call me, and he had me in on a Saturday in the Oval Office. And I remember it was a beautiful day outside, and I'm sitting on the couch and looking out the window and seeing, you know, his family, you know, walking through the South Lawn and having guests. And he just dictated, essentially, what he wanted to say to me. And he would pace in circles around the Oval Office. And we had a session that almost went an hour. And he really wanted to tell a story. How did we get to this place of dysfunction? You know, he wanted to go through colonialism and the Cold War, and the Gulf War and then of course 9/11. And so he kind of narrates the story he wants to tell of how we became separated from one another and how we in the United States don't always appreciate the contributions that had been made by Islam over the centuries, and also how in the Muslim world there's not an appreciation that America does represent pluralism and that, frankly, Muslims are very successful in the United States. And then he wanted to go through each of the issues - terrorism, the Arab-Israeli conflict, the Iran issue, democracy, women. He wanted to literally go through the list of issues that had caused tension and express his view. And he would give me that input so that I'd be sitting there with this - you know, I'm a young guy then. I'm 31 years old at the time. And I have to take this back to cabinet officials and, you know, senior White House officials. And I'd turn that into a speech, and then I circulate that speech to all those senior people. And then they start, of course, editing it to make the points that they want to make. DAVIES: Yeah. So what did they want? RHODES: Well, you know, everybody has a policy that they want to work through. In this case, the most difficult issue ended up being the Arab-Israeli conflict. You know, and Obama wanted to talk in pretty stark and honest terms about the fact that, you know, this is an intolerable situation. And he wanted to use language that American presidents didn't always use, like calling the Israeli occupation an occupation. And, you know, that made certain advisers nervous, and we ended up, you know, kind of watering down language in different parts and how we talk about Israeli settlements. But also he wanted to call out Holocaust denial in very stark terms, and people thought, well, you know, getting in people's face in the Muslim world, you know, could evoke a backlash in the room. And so generally the process that happens in editing is stuff gets watered down. DAVIES: Looking back on the way the Republicans used it, particularly Mitt Romney in the 2012 campaign against Obama, and a lot of people in Congress and in the right wing, was it the right call to give that kind of speech, do you think? I mean, with the benefit of all your years since then? RHODES: You know, I'll never forget, Dave. We were flying into Cairo. And, you know, he had been up late editing. I'd been sitting with him in a strange, ornate palace in Saudi Arabia the night before. He came back, and we're going through some stuff and he turns and looks at me and he says, we're really saying a lot in here, you know? And I was like, yeah, you are. And I was like, you know, people are going to hold you to this. And he's like, well, you know, this is the kind of thing I'm not saying for right now. This is what I believe, and only history will be able to tell how this turns out. If you don't honestly stand up and say what you believe then what's the point of being president or going into politics? And, you know, the reason Barack Obama was a successful politician, I believe, is that people thought he was honest and authentic. DAVIES: We're speaking with Ben Rhodes. He was a deputy national security adviser to President Barack Obama. He has a new memoir of his eight years in the White House. It's called, "The World As It Is." We'll continue our conversation in just a moment. This is FRESH AIR. DAVIES: This is FRESH AIR. And we're speaking with Ben Rhodes. He was a deputy national security adviser to President Obama for eight years. He has a memoir of his time in the government. It's called "The World As It Is." You worked mostly on foreign policy issues. And it just seems, again and again, you know, confronting crises around the world is a matter of choosing from bad options - or at least very risky options. And I thought we'd talk about the one on whether to intervene militarily in Libya when Moammar Gadhafi was under assault from protests and was responding with, you know, essentially a campaign of military attacks - slaughter against many of his own citizens. And I guess it was when there was the prospect of a massacre in Benghazi - a massacre of civilians in Benghazi by the Gadhafi army that there was a lot of pressure among a lot of countries to intervene militarily. And the president faced this tough choice. I mean, he learned the lesson of the Iraq War. You know, avoid a lot of these - don't get into stupid wars is, I guess, what he would say. He liked to go around the room and get a lot of opinions, including the edge of the room, you say, where some of the younger aides were there. When he got to you, what did you say? RHODES: Well, Dave, we had this very dramatic meeting because we all came into the situation room. And there was maps in front of us. And the maps showed the advance of the Libyan army to the outskirts of Benghazi. And there was a briefing that Gadhafi was a couple of days away from essentially entering the city. And he had said he would go door to door and, you know, basically route out - like rats, he said - his opponents and kill them. And there are very few times in your life where you have this bizarre experience of sitting in a room, and somebody is basically telling you, if you do nothing, the people in this city, which is just a dot on a map, will be killed. But if you do something, you might be able to save those people. And there also was a debate going on at the U.N. because we actually could get international support to pass a U.N. resolution to do something to stop this from happening. And he went around the room. And, you know, I remember Biden essentially said it'd be crazy to get in another war in a Muslim country. And Gates and Mullen, the chairman of the Joint Chiefs, said essentially, we don't want to take this on. We already have Iraq and Afghanistan. And he started to go around the edges of the room. And I'm sitting there thinking, you know, what am I going to say? And I'm sitting next to Samantha Power, you know, who wrote literally the book on mass atrocities, "A Problem From Hell." DAVIES: And we should just add the other part of the equation as well. If we stop the massacre, now we're committed to what and how many years? And, you know, what follows? RHODES: That's exactly right. You know, so it gets to me. And I thought we had to intervene. And the argument I made to Obama, knowing how he thought - I wanted to make him essentially occupy the position of not doing it. And so I used my communications and speechwriting role. And I said, how will we stand up in front of the world and explain why we didn't do this? You know, the world was prepared to do it. You could have gotten a U.N. resolution. We had the evidence that this was about to happen. I was like, try to imagine the speech you're going to have to give to explain why we're not doing this. And ultimately, you know, he said it's a 51-49 call. He decided to do it. He decided to intervene and that the U.S. should lead that effort. But then he was very clear. He gave instructions to us. I want to make sure that the Europeans take off a handoff from us - that we go in heavy at the beginning and essentially take out Gadhafi's military and put in place a no-fly zone. And then the Europeans will lead that effort. So he was trying to cap in a slippery slope into another Iraq War in Libya. DAVIES: Right. And so he said, I want the other powers - and in a matter of days not weeks. DAVIES: So it happens. They put together an international coalition. The massacre is prevented. And then you described seeing what the reaction - I mean, he'd been pestered with questions, understandably, about what are you going to do about this impending massacre or when they decide on a course of action. The massacre is averted. You watch Jon Stewart, and you watch other things. And what do you hear? RHODES: Well, it's fascinating, Dave. When you're in the White House, the pressure can shift 180 degrees in one moment. So for days before we intervened, it was, when are you going to do this? How many have to die before you act? The second we intervened, it was totally in the other direction. And it was, you know, how are you going to get out? When is this going to end? And I remember, you know, I felt very passionate about what we were doing. But it was a hard thing to communicate. And one of the tough questions, for instance, was - we couldn't say we were at war because we weren't getting a congressional authorization. And, you know, our lawyers thought we had to use more moderated language or else it would call into question the legal basis for what we were doing at home. And what I remember is - you know, I gave an interview where I said - I was asked a question. Well, are you at war in Libya? And I knew that I couldn't say yes. I knew that's why the person was asking the question. It's one of these things that comes to you when you have a communications role. And I said, well, we're pursuing kinetic military action in Libya which, you know, sounds exactly as slippery today as it probably did then. And I remember sitting at home. And I hadn't been a public figure, Dave. I was still in my early 30s. I hadn't kind of been in the limelight. And I'm watching Jon Stewart who for a guy like me - you know, I'm his demographic. And he has a whole segment called like Libya: Not At War. And he kind of puts the picture up of me looking like I'm about 10 years old and then my quote. And I realized though what a weird position we were in because everything we did the right was going to hate. So before Obama went into Libya, they were for war in Libya. The second Obama went into Libya, they were like, what the hell is Obama doing in Libya? But in then the left, there was, after Iraq particularly, a lot of, you know, anxiety about any military action. And even on a show like Jon Stewart's, where you've had thoughtful conversations about Rwanda, you know, the default was to say, well, what the hell are we doing in Libya? And I realized - and this is before obviously the debate picked up around Syria - there wasn't a constituency to intervene in these in these countries. And, you know, that feeling of being politically isolated, which, you know, only grew more acute obviously after Benghazi became not a city but a scandal. You know, I remember feeling that acutely in those days. DAVIES: In late 2015, this attack line from the Republicans emerged that Obama wouldn't use the phrase radical Islam as an enemy in the battle on terrorism. How did you and the president understand this critique? RHODES: Well, you know, I'll never forget that this became an issue whether or not we said radical Islam around the time that ISIS was really front and center on people's minds. And, you know, we had decided to essentially not declare our enemy radical Islam because I remember, you know, we had many meetings with the Muslim community, and they would say when Muslims hear radical Islam, they don't hear radical as, you know, an adjective about Islam. They hear it as that's what we think of Islam. Islam is radical. And Obama called me up to his office one day, and he'd read a column that irked him about how we wouldn't say radical Islam. And he said I don't know why we're being so politically correct about how we talk about terrorism. And I'm standing in the Oval Office thinking, we've taken all this heat because we're not using this phrase because we've been advised by Muslims that this is more likely to alienate the very Muslims we need to be partners in this effort. ISIS wants to be seen as religious leaders, so they want us to use religious labels as we - in the way that we talk about them. So I start to try to explain these things to Obama, and he says, no I get it. Like, if radical Islam to Muslims might mean, you know, all of Islam is radical, but I'm certainly not afraid to say that it's part of the character of this ideology. He said it's fundamentally in the Islamic world. But then we were talking around it and realizing that, you know, basically this debate is not about the correct terminology and how we identify our enemy. It's about American politics. And the American political debate wanted to pull us into saying something that was not the right thing to say if you want to alienate ISIS and you want to enlist Muslims as partners in dealing with the actual enemy. And that's often a place where we find ourselves in where we were doing the thing that was, you know, correct, I think, in terms of not giving in to the type of terminology that could alienate the very people we needed to work with but created political problems for us at home. DAVIES: You said the president hated when people called him aloof. What's your take on that? RHODES: Well, you know, I remember - you know, I describe in the book, you know, we would have these conversations where he would call me up and say I just don't understand why these people keep calling me aloof. He had a lot of friends. One of the things that drove him crazy is that there was this criticism that he didn't have friendships with foreign leaders. And I remember him saying to me like, no, really, I'm really tight with Cameron. I like David Cameron and Angela Merkel. I love Angela. But, you know, I think part of what bothered him about that is he'd say to me, look, I know that some former presidents were kind of real social animals in Washington, you know, and they'd get around, and they'd seek people's opinions all the time. Obama at 6:30 went home and had dinner with his kids. And part of it was just their ages, you know? And so he - if he had free time, he tended to spend it with his kids. I think the other point is that the thing that drove him crazy was this notion that he - if only like Lyndon Johnson, you know, he'd just have more drinks with Republicans, they'd come to be bipartisan, and they just weren't interested in that. You know, I describe one time the movie "Lincoln" came out, and the movie "Lincoln" is about, you know, cooperation in Congress and hustling votes and trying to get something done. So Obama invited a bunch of Republicans into the White House movie theater to see this movie, and not a single one of them came. So it's not like they would come have drinks with him if he wanted to. And so I think he got frustrated that he was blamed for things he could do nothing about. He could not make the Republicans work with him. And yet, you know, it was easier to say Obama's aloof than to say, well, why is it that a major political party won't work with this guy at all? DAVIES: Ben Rhodes served eight years in the Obama White House. His new book is called "The World As It Is." After a break, he'll talk about what it was like being personally targeted by angry conspiracy theorists and about Obama's reaction to the election of Donald Trump. And John Powers reviews the new TV series "Condor" based on the 1975 movie "Three Days Of The Condor." I'm Dave Davies, and this is FRESH AIR. DAVIES: This is FRESH AIR. I'm Dave Davies in for Terry Gross, who's off this week. We're speaking with Ben Rhodes, who spent eight years in the Obama White House as a key player on foreign policy issues. He served as a speechwriter and deputy national security adviser for strategic communications. His new memoir is called "The World As It Is." You write there was a point when an old White House hand asked you and another aide do you have federal liability insurance, which you had never heard of, right? RHODES: Well, I was sitting in my friend's office in this - Pete Rouse, who was a chief of staff for us, an old Washington hand, comes in and he says, you know, get this federal liability insurance - no questions asked. It's not optional. And, you know, it's like - I went online and bought a policy for a couple hundred bucks. And it's insurance against investigations while you're in federal service. Little did I know that that ended up saving me certainly $100,000, if not more, Dave. DAVIES: So it pays your legal costs if you are hauled into an investigation, and you were. Why? What were in - who were you investigated by and for what? RHODES: Well, you know, I learned it's kind of an occupational hazard. But what was also interesting is how arbitrary what gets investigated can seem. So what happened with me is there were two leaks of national security information in 2012, one about an operative that we had inside of al-Qaida who helped us foil a terrorist plot and one about a hack of the Iranian nuclear program. And simply because I was somebody who had a responsibility to talk to reporters about both of those issues, you know, I was going to be hauled in. And actually, Rod Rosenstein was the assistant U.S. attorney, now the deputy attorney general, you know, who hauled me in on the Iran investigation. I, you know, I ended up not being a target. But you spend hours being grilled, you know, by FBI agents. And, you know, it's unsettling to say the least to find yourself in those circumstances. DAVIES: Right. And once the Republican attacks associated with the tragedy in Benghazi got under way - right? - you had to testify before Congress on that because every communication, every email from that period was pored over again and again. And, you know, you're right about your frustrations with the media, including there was a report by ABC - an exclusive ABC report of an email that you sent in the days that - I guess the day after Benghazi that had to do with, you know, talking points for the Sunday talk shows maybe. DAVIES: And it turned out - you looked up the email, and the text of what they reported was simply wrong. Does this happen where someone actually reports on a document that you supposedly authored and made no effort to contact you? RHODES: Yeah. You know, what I saw over the course of the years that we were there was this evolution of how the Republicans attacked us and how the media dealt with that. And, you know, I describe in the book, first of all, the root of the Benghazi situation. I described that day, what it was like to be in the White House where allegedly we were hatching some conspiracy theory when in fact we were dealing with a horrible tragedy, but we didn't have all the facts. And then, you know, two years later, I'm reading a report about an email that I had sent that week of the Benghazi attacks. And the email didn't look right to me, you know? And I'm in this firestorm because the email essentially confirms a conspiracy theory that we had put our thumb on the scale to protect Hillary Clinton and said, you know, the State Department has the lead on this, and we need to take their concerns more seriously than other agencies. And it didn't sound right to me, Dave. So I had this weird experience of being at the center of this massive controversy and people saying horrible things about me and then looking up the actual email and seeing that it's very different. And I realized that essentially a line had been crossed in how scandal was used against us in the sense that what had happened clearly is that the Republicans didn't like what was in my actually email, so they literally just made one up and gave it to a reporter. And he reported it. And, you know, that I think does explain some of the trajectory that we've seen in our politics, where once the facts became not convenient to the conspiracy theory about Benghazi, say, well, we'll create some alternative facts. DAVIES: Right. And ABC eventually did acknowledge the correct text. Although, I still don't understand how they run it without calling you in the first place. You know, you write about the frustration of being targeted as this controversy grew and when things would go in the right-wing media, you would get email and tweets calling you a fascist, a Nazi, an Islamist, you know, making personal threats. There was one point where I believe you actually had personal security. What kind of personal toll did all this take? RHODES: It took a huge toll, Dave. I mean, I - look; part of this story I'm telling in this book is, you know, I was 29 years old when I went to work for Barack Obama and 31 when I came to the White House, so, you know, I was a relatively anonymous guy, you know? And for whatever reason, I became kind of a - one of the villains for the right. And the story I tell is how they basically constructed this scaffolding of a Benghazi scandal around me. And every now and then, it would flare up. But what I describe is that, you know, social media gives you a window. So, you know, every now and then - I had a Twitter account. I didn't use it much. But I could tell suddenly, you know, there - instead of 10 people tweeting me one day, there's, like, thousand people tweeting at me. And I could tell that somewhere out in America, like, a talk radio segment had run. And, you know, they're threatening my life. They're, you know, simultaneously calling me, you know, anti-Semitic slurs and saying I'm a Muslim Brotherhood operative. I had the Secret Service actually patrolling my block at some point. I didn't sign up for that. You know, when I went to work to write speeches for Barack Obama, you know? And I'm - one morning I left my house at my dry cleaning. You know, the only time you're kind of a normal person, Dave, when you're in these jobs is moments like that - you know, 7 a.m., getting my dry cleaning, slung over my shoulders. And a Fox News camera literally chases me up the stairs in my apartment building, camera pointing me, yelling, what about Benghazi, you know? And by the way, this is like two years after Benghazi. And it - what I talk about is it kind of distorted me. Like, I didn't know at the time how much that was making me kind of angry - that, like, you know, you push it down. But the experience of working became much less joyful. And cynicism does creep in. And your kind of relationships suffer a little bit because you become kind of grumpy. And I stopped sleeping very well. So yeah, I wanted to convey, like, this all looks like a game from afar. But, like, there are human beings who are in these jobs, and it can take a real toll. DAVIES: Ben Rhodes book about his eight years in the White House is called "The World As It Is." We'll continue our conversation after a short break. This is FRESH AIR. DAVIES: This is FRESH AIR, and we're speaking with Ben Rhodes. He was a deputy national security adviser to President Obama. His memoir of his eight years in the White House is called "The World As It Is." You know, it was interesting. You write that nobody was surprised by the hack of the Democratic National Committee's emails and that you were told from day one on the job to assume that any unclassified email you sent, any phone call could be intercepted by the Russians. I mean, that kind of surprised me. DAVIES: When did you and the - when did you become aware of serious efforts by Russia to influence the 2016 elections? RHODES: You know, I really didn't become aware until there was the release of the DNC emails in, you know, the late spring of 2016. For the reasons that you cite, Dave, there was nothing unusual about the Russians hacking. They'd been doing that the whole time we were there. What was unusual is that they released the information publicly. What's really important, though, that I describe is I had seen them cross into a new space in Ukraine. I'll never forget the day I came in. And someone came into my office who worked for me and said, hey, did you see this phone call that the Russians released? And it was an intercept of a conversation between our assistant secretary of state for Europe and our ambassador in Kiev. And they're talking about, you know, certain Ukrainian figures in the protests that were taking place at that time in 2014. And it kind of confirmed in the Russian's view, that we were meddling in Ukrainian politics. And so - nothing unusual frankly about Russia hacking or intercepting a phone call. Just releasing that into the public domain - that's what was new. And we saw them cross all these lines in Ukraine. Suddenly they're making stuff up with no basis in fact. They're releasing hacked information. They have social media bots who are creating huge volumes of fake news. And that's why it's so important to understand that where this all shifted was in Ukraine. And what I saw in 2016 that was very chilling to me was they just took that arsenal that they had developed of information warfare in Ukraine, and they just moved it right into our election. DAVIES: Now, you know, there's an interesting paragraph you have here where you say to understand what ended up happening in the 2016 presidential election, you have to understand that when protests toppled the Ukrainian government, Putin interpreted that as the United States coming into Russia akin to an act of war. And when he launched his counterattack annexing Crimea, sweeping into - creeping into eastern Ukraine, he weaponized information, showed a willingness to lie using traditional media like TV and new media platforms like Twitter, Facebook and YouTube to spread disinformation to open Western societies like a virus. So in a way, you think Putin was responding to what he saw as a U.S. aggression. RHODES: Yes. And, you know, I don't mean that to say that he's right. But the reality is, you know, he - his mindset - his worldview is Ukraine is part of Russia. It's not just part of the former Soviet Union. It's different from, say, Estonia. And I remember we'd have these phone calls. You know, after Yanukovych, the president of Ukraine, you know, who was backed by Putin - he bailed and fled to Russia. Putin would have these phone calls with Obama. I'd sit in the Oval Office and watch them. And you could see this whole thing unraveling because they'd just be talking past each other. You know, Obama would be giving facts and talking about how we don't need to go down this road of confrontation, and we're going to put sanctions on you if you continue to move into Crimea or eastern Ukraine. And Putin - all he would ever do is come back to the fact that, you overthrew Yanukovych, you know? And he had seen U.S. wars of regime change in Iraq to get rid of Saddam Hussein, who was a partner of Russia, Libya to get rid of Gadhafi, Gadhafi who ended up dying in a sewer pipe. And now he saw this coming to Ukraine. And, by the way, if it succeeds in Ukraine, then next stop he thought would be Moscow. And you could just sense in the conversations that, yes, he would lie and obfuscate. But he did truly seem to believe that we had some hand in Yanukovych's ouster. And Obama would continue to say, no, we didn't. And what I saw is the whole Russian mindset changed. I mean, yes, they had been hostile, adversarial. But suddenly it was like all bets are off. DAVIES: You know, write after the election, which was a shock to you and a lot of Democrats - there's a moment - I think you open the book with this - describing being with the president afterwards. You were on a foreign trip. And he said, what if we were wrong in looking at the election results? What did he mean? RHODES: Well, what was interesting is that I saw Obama go through kind of the stages that, you know, I saw some my friends go through. What happened? You know, he called me election night. We were just kind of shell-shocked. And he sent me - I remember - a note that night. There are more stars of sky than grains of sand on the earth, you know, just groping for perspective here. And then, you know, we play through the tape of the Russian interference, and could the Democratic campaign have been done differently and the Comey letter? But when we went abroad, Dave, the consequences of the election felt kind of more stark because the rest of the world was just dumbfounded at what had happened. I mean, they just couldn't understand it. And we saw Angela Merkel. I remember we had dinner alone with her for three hours. I don't think he'd ever spent that long alone one-on-one with a foreign leader. And when he said goodbye to her, she had a tear in her eye. This is - talk about the iron lady. We didn't expect to see that emotion from her. And when we were, you know, in our last stop in Lima, we had just seen Justin Trudeau. And, you know, he kind of represents a certain brand of liberal values that Obama does. And he looked kind of shell-shocked. I think we all anticipated the trade stuff that is happening now. And chillingly, we saw Xi Jinping, who - you know, when Obama tried to warn him about, well, Trump means what he says on this trade stuff, he looked real comfortable. And he said, look; if an immature leader throws the world into chaos, the world is going to know who to blame. And he's referring to Trump of course. And what we realized then is that, you know, the Xi Jinpings of the world - they can manage this outcome. But the Angela Merkels and Justin Trudeaus of the world - they've got a big problem. And so when Obama said that to me in the limo on the way to the airport, what he was talking about was not just, like, his presidency. I think he was talking about a liberal brand of politics that has actually been, you know, the norm in the West for decades that involves the free movement of people and immigration and trade, all of these things that Trump had demagogued in the campaign in addition to his kind of toxic racism and misogyny. You know, what Obama is saying is like, look; maybe people just want to fall back into their tribe. You know, maybe the project of globalization, of European Union and of the kind of accelerating change in America - you know, maybe that got too far out ahead of people's instinctive desire to cling to their identity. Now, in the end, frankly I wrote the book in a way to answer that question. I don't think we were wrong. I think America in 20 years is going to look a lot more like Barack Obama than Donald Trump. But, you know, we've certainly felt obliged to wrestle with these questions and to second-guess ourselves to understand the result of what happened in November of 2016. DAVIES: You write about the days after the election, before the inauguration, including the day when Trump visited the White House and had a friendly interaction with Barack and Michelle Obama. What did you observe or learn of their interaction, the president and Donald Trump? RHODES: Well, you know, I kind of avoided - you know, I didn't necessarily want to catch a glimpse of Trump. But Obama called a group of us up to the Oval Office after he'd had this meeting. And he was kind of almost confused, bemused. I don't know what the word is, but it had been this very strange encounter. And he was kind of trying to process it himself because he basically said, you know, Trump tried to be incredibly ingratiating, and was praising Obama and kept talking about how - you know, Obama would be talking about some policy, and Trump would take the conversation back to you and I can both get really big crowds. You know, you got big crowds, and I got big crowds. But, you know, Hillary, you know, she can't get big crowds. As if that is still important. You know? And Obama's trying to literally say to this guy, hey, you know, here's what you need to know before you take over the most important office in the world, you know? And he's trying to talk about crowds. And then, you know, Obama would make a case for a certain policy, and he said Trump would be very favorable - yeah, that sounds good. I want to look at that. You know? And he didn't seem to be, you know, obliged, Trump, to defend his own policy positions or even explain them to Obama. He just kind of was very much at this kind of surface level. And I remember Obama said to me, you know, I'm trying to place him in American history. You know, like, what - 'cause this isn't George W. Bush, or John McCain, or - this is something different. And I just blurted out, well, he peddles BS. That's a character in American history, the kind of con man. You know, you see that all the way back to Mark Twain and "Huckleberry Finn" and the characters in that novel, you know? And Obama kind of chuckled, like, and said, well, maybe that's the best we can hope for - in the sense that maybe that would mean that, you know, this is just about the show, and some of these more frightening things that Trump is talking about doing, he won't actually do. Unfortunately, it turns out, he actually is (laughter) doing many of the things that he said he would do. DAVIES: Ben Rhodes, thanks so much for speaking with us. RHODES: It's really, really great to be with you, Dave. 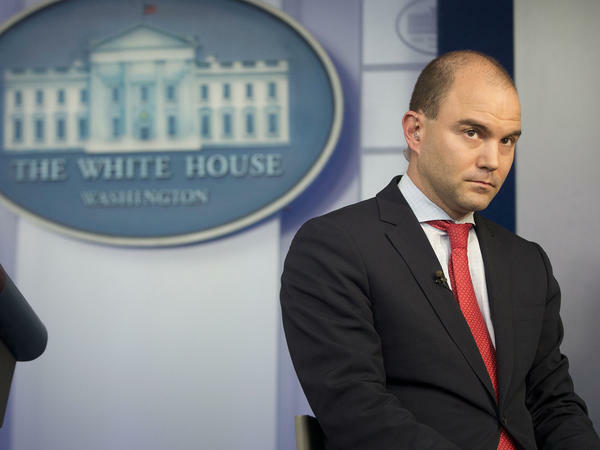 DAVIES: Ben Rhodes served as a deputy national security adviser in the Obama White House. He's continued to serve as an adviser to Obama since leaving the government and is a contributor to NBC News. His memoir is called, "The World As It Is." Coming up, John Powers reviews the new TV series "Condor," based on the 1975 movie, "Three Days Of The Condor." This is FRESH AIR. Transcript provided by NPR, Copyright NPR.